Community Action Nepal (CAN), a charity and NGO/INGO which has been operating in Nepal for over 20 years, was announced as the sixth winner of the annual UIAA Mountain Protection Award at the 2018 UIAA General Assembly in Ulaanbaatar, Mongolia on Saturday 6 October. The 2018 MPA Trophy was collected by Trish Scott and Murari Gautam, CAN Nepal UK’s country representative. Following KTK-Belt in 2015 and the Mount Everest Biogas Project in 2017, CAN is the third winning project which works closely with Nepalese mountain communities. CAN was set up by legendary mountaineer and former UIAA Management Committee member Doug Scott CBE, the first Briton (with Dougal Haston) to climb Everest in 1975. In creating CAN, Scott wanted to give something back to the mountain people of Nepal who had helped him climb 14 peaks in the country. It was a key legacy which emerged from the historic 1975 British Everest SW Face Expedition. In 2015, CAN’s focus took on a more specific objective. 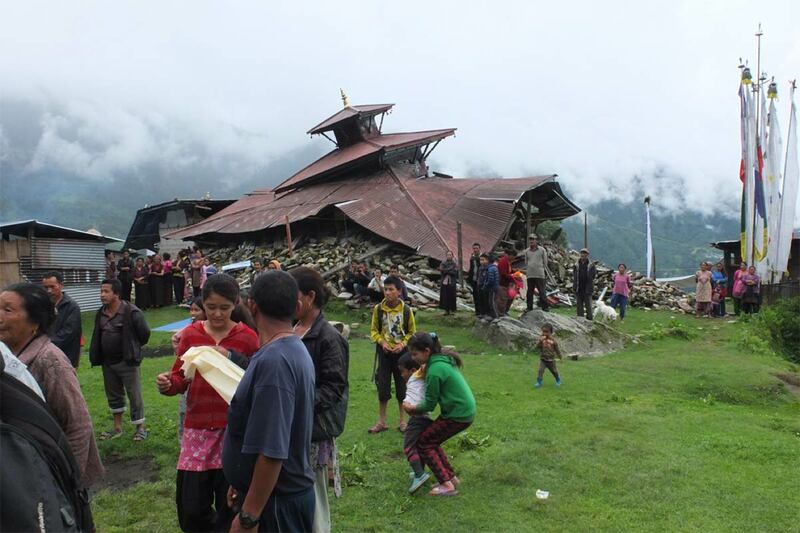 Following the devastating earthquake which hit Nepal in April of that year, the charity’s strategic objective was directed towards supporting the recovery of earthquake-affected communities in remote mountain areas. Much of CAN’s own work over two decades was wiped out in a matter of minutes following the disaster which killed nearly 9,000 people, injured more than 22,000, destroyed entire villages, displaced almost three and a half million individuals and caused over ten billion dollars worth of infrastructure damage. Century-old buildings, monasteries and temples were destroyed at UNESCO World Heritage Sites in a number of areas including Kathmandu, Lalitpur and Bhaktapur. CAN’s recovery work has been directed towards rebuilding vital community assets such as health posts, schools, porter shelters and gompas, while at the same time maintaining core health and educational provision and supporting livelihoods. New buildings have been designed to be more earthquake resistant ensuring that should enough disaster occur, the infrastructure will prove more robust. “Assigning this year’s winner was a difficult task,” explained UIAA Mountain Protection Commission President Dr Carolina Adler. “The score results were among the top-ranking projects was very close. Nevertheless, CAN and its work in post-earthquake recovery in Nepal, has been instrumental in helping to support the rebuilding efforts of local communities who themselves provide so much for mountaineers in their pursuits in the mountains. It is great to see this solidarity”. CAN, whose work is driven by a motivation to help protect mountain communities and is underpinned by the principles of sustainability and the protection of the environment, was one of eighteen projects nominated for the 2018 UIAA Mountain Protection Award. This included six re-nominations and twelve new projects active in 25 different countries. Giroparchi Nature Trail by Fondation Gran Paradis, Italy, was named runner-up and A system for the management of health and safety in wilderness areas by Tracks Safety, Argentina, was recognised as the best new initiative. The full list of nominees can be found at the foot of this news release. “We are very pleased to see a broad range of projects nominated for the MPA this year, in particular it is great to see a genuine interest and action, on behalf of the mountaineering community, on issues of development and support for the livelihoods of communities that live in the mountains and with whom we have direct interaction as part of our own visits to the mountains,” continued Adler. The livelihoods of 80% of local people in the mountain regions of Nepal are dependent on climate sensitive areas including agriculture, forests, livestock and water. Prior to the scientific consensus about climate change, CAN supported reforestation programmes and the protection of habitats. It has promoted the use of clean/solar energy in its projects, the installation of hydro and the use of clean burning stoves. In many communities CAN has installed clean water and sanitation and supported water management schemes to ensure that local water supplies are safe. Education, improving the daily lives of mountain people and mountain protection work hand in hand. CAN has therefore encourages and supported land management promoting the use of organic agricultural methods, including composting and natural methods to strengthen pest control and the diversification of vegetables and fruit to improve nutrition and strengthen food security. Furthermore, CAN has a long track record working with farmers to manage livestock and the dangers of overgrazing as well as supporting honey production which supports biodiversity, given the key role of bees as pollinators. Its disaster risk reduction (DRR) work has focused on preparing for future earthquakes with training also focusing on conservation and protecting local eco-systems. Many of these interventions have had a positive impact on human health. CAN’s nurses work around contraception is helping to support population control, with evidence from academics that CAN health posts are having a significant impact on local birth rates. Beyond this their work rebuilding and preservation of gompas, stupas and other such structures has helped enhance local cultural capital benefiting local people and tourists. “When I look back over the last three years since the earthquake, the most amazing thing to me is the generosity of people from around the world when they can see a need and when they feel that any donation they make will hit the target,” remarked Doug Scott. “This was never more so than in the UK, where people from all over the country, young and old, donated £3 million, trusting in CAN’s checks and balances to spend their money wisely. With their help and a super effort by Murari Gautam and his team in Kathmandu, we repaired or completely rebuilt the some fifty projects hit by the earthquake in just three years. From the chaos of the earthquake, CAN, like many village committees, accepted the challenge and is now stronger and more effective than ever before in helping the communities we serve”. As identified by a number of UIAA Mountain Protection Award initiatives, waste management in remote mountain communities is a real challenge. To help combat this pressing issue, CAN has undertaken training about composting of inorganic materials (70% of solid waste generated in Nepal is organic), recycling and safe disposal which does not impact negatively on downstream users. CAN adopts the ‘Reduce, Reuse, Recycle’ mantra. A recent example is provided by an initiative which took place in North Gorkha, heavily impacted by the 2015 earthquake, in December 2017. CAN was invited by local communities to provide its expertise about the concerning impact of tourist waste on the region. CAN’s response was to offer its support by encouraging the community to develop their own solutions based on local knowledge. CAN also played a more ‘hands on role’ by encouraging trekkers to contribute to the financing and management of waste they create through the implementation of fees and by providing awareness raising and advocating bring-back-your-own waste behavioural codes. From its headquarters in the UK the work of the charity is overseen by the Board of Trustees, which is responsible for agreeing organisational priorities and strategy and policies. The Operation’s Director, Doug Scott (unsalaried) is appointed by the Board of Trustees. He has overall responsibility for managing the day to day running of the charity. He is supported by a small team of CAN office staff and works closely with CAN’s Operations’ Director in Nepal, Murari Gautam. CAN Nepal is made up of a Management Committee, chaired by Purna Gautam, with members representing the range of communities where they operate. Every year CAN organises fundraising lectures across the country which seek to engage with mountaineers, trekkers and walkers. The lecturers include Scott, Sir Chris Bonington and Mick Fowler, with speakers in the past including world renowned mountaineers like Reinhold Messner, Peter Habeler and Alex Huber. As a result of these lectures CAN reaches audiences of between 3-5,000 people a year. In parallel, CAN undertakes a series of high-profile fundraising events to expand its profile, with a mountaineering team recently climbing to the North Col of Everest in support of CAN. 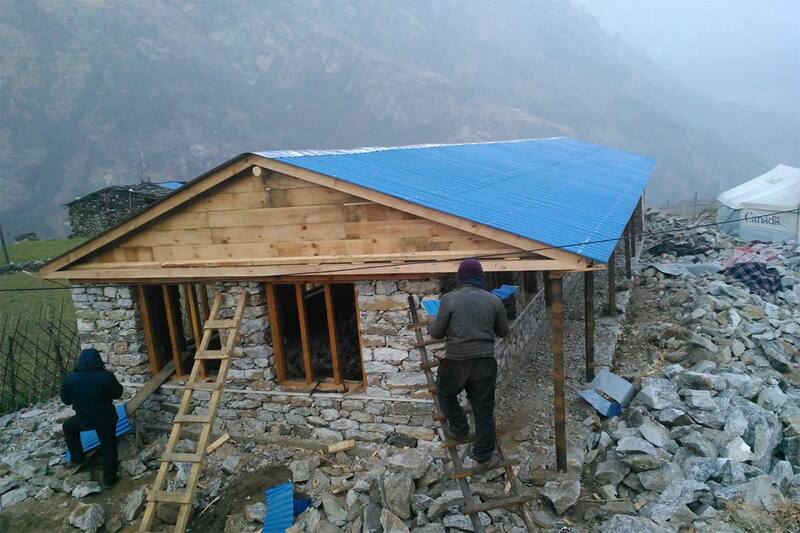 They hope to raise over £100,000 to support further reconstruction work in North Gorkha. “In the course of checking that all projects had been ‘built back better’, we were approached by municipal representatives in North Gorkha to put in seven more health facilities and a negotiated agreement was drawn up,” explains Scott. “We have also established 30 kitchen gardens at our schools and health posts. We look forward to expanding these and the variety of vegetables and soft and hard fruits without any introduction of manufactured chemicals and fertilisers, with a view to improving not only the variety of crops but also the yield variety of the foodstuffs. All this with the active engagement of the villagers”. Through its longstanding commitment to Nepalese communities, to mountain protection and by directly engaging climbers and mountaineers with its initiatives and as part of the solution, CAN is a worthy winner of the 2018 UIAA Mountain Protection Award.